Can’t Cook but Need to Eat? Ever have those days when for one reason or another you can’t cook a “real” meal? No time, illness, or any number of things can put us in a position where we might break the bank to feed ourselves or our family if we run out for fast food or buy frozen dinners. It’s great if you can pull something from the freezer, but what do you do if you have to wing it? Peanut Butter Toast – seriously! Peanut butter toast, or on bagels or English muffins. It’s warm, comforting and has a good amount of protein. Even peanut butter on crackers. Other nut butters are good, too. Take it to the next level with bananas or try a grilled peanut butter sandwich. Crackers & Cheese – add some summer sausage or lunchmeat for your own “lunchables.” Make the crackers whole wheat and they’re even better. If you want to be a little fancy, do what my son does – he melts the cheese in the microwave. For dessert? Jam on crackers. Salad – if your grocer has a salad bar, you’re set, if not grab a premade bag with all the fixin’s – something I don’t normally advocate, but, hey, if it’s a choice between McDonald’s and a salad, I’d opt for the salad. Here’s my Salads Menu, everything from full meal to sides, easy to fancy. French bread pizza – slice the bread in half the long way, smear with pasta sauce, add cheese and broil. You can do the same with English Muffins. You can add pepperoni or raid the fridge for complementary leftovers as toppings. Grilled Cheese Sandwiches – always cheap and easy; you can go with the basic American style “cheese” and bread or use whatever you have and even layer in meats or vegetables. If you really want to be fancy, use your grill pan or panini press, or layer your sandwich toppins on bread, opened face, and make a broiled sandwich. French Toast – even for dinner! Quick and easy. Try smearing it with jam instead of syrup, or serve with fruit to fancy it up. A sprinkle of powdered sugar can make it feel special. If you want to go high end, consider this variation of Tyler Florence’s Oven Baked French Toast, although it’s not as quick and easy. 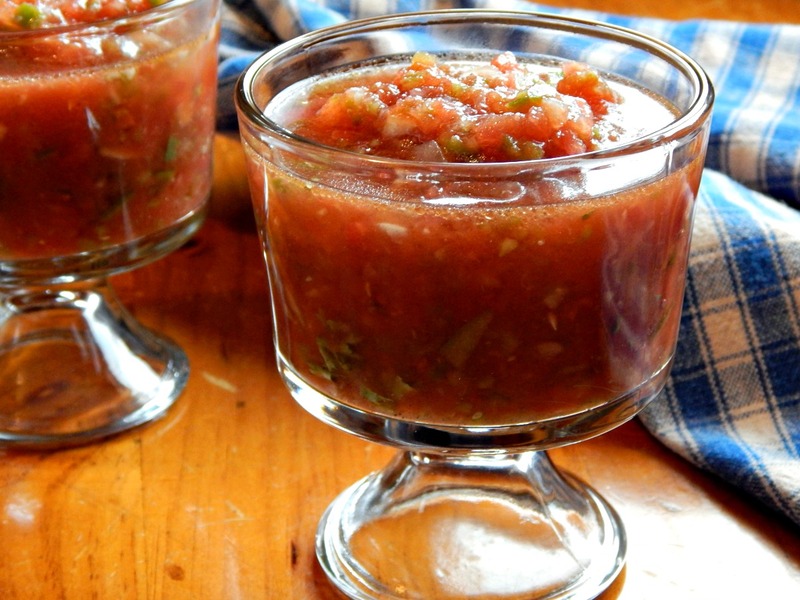 Gazpacho – Here’s a simple Gazpacho. Just roughly chunk the vegetables and pulse everything in the food processor. Great for a summer day. I normally remove the skins and wait for it to chill, but really, this is optional. Talk about cheap and easy AND good for you. BLT: Bacon, Lettuce and Tomato – bake the bacon in the oven for about 20 minutes and you don’t have to watch it and turn it. Crostini: Drizzle olive oil on bread and broil till toasted, then layer on your toppings from whatever you have in your fridge and broil. In a pinch we’ve even used hot dog/hamburger buns, spread them with garlic butter, sprinkled with cheese and broiled. We call this Parmesan Toast. An amazing Crositini topping can be made with vegetables you may have in the freezer – especially Lima Beans or Peas. Fruit Plate or Smoothie: Throw whatever you have on hand in the blender with some juice and/or yogurt and ice. Add some cottage cheese to the fruit plate for a little extra protein. Oatmeal: I nearly forgot oatmeal, one of my favorite foods. Don’t go with the processed, artificial packets, get real, generally labeled “regular” oatmeal and make it in minutes in the microwave or on the stove. You can buy a boatload of “regular” oatmeal for the price of a package of packets, and regular oatmeal has proven to be so good for you nutritionally, in many well documented studies over the years. It is a whole grain, and much of the nutrients are destroyed when heavily processed. Dress it up anyway you’d like, a bit of sugar or cinnamon sugar, fruit, milk, or eat it plain. Add a teaspoon of jam if you want it “flavored!” I even make larger batches and portion it out for several quick breakfasts – I just reheat in the microwave. Dirty little secret??? Regular oatmeal cooks in the microwave in two minutes. What are your favorite cheap and easy meals to get on the table fast? How do you dress up these simple meals? This entry was posted in Click here for Bargain Meals and tagged Cheese, Easy Recipe, Eggs, Frugal Hausfrau, Fruit, Oatmeal, Salad. Bookmark the permalink. There are instructions for all different kinds of oats, quick, old fashioned, instant, steel cut…. Thank you. I should have thought of doing this search myself. I’ve bookmarked the page myself now. 🙂 Do you have a good lemon meringue pie recipe? This is hands down the best lemon meringue I have ever tasted! This is the stuff we grew up eating as my mother didn’t like to cook. I mean, she made meals but I remember an awful lot of this on weekends and after school. I did’t realize we were so frugal! I thought she just didn’t like to cook! 🙂 ha! Even now I’ll eat oatmeal for dinner when Matt’s out at sea. I’ll make the steel cut oats in the crock pot and eat on it for days. I love that darn crock pot! Noticed you mentioned your love of the Crock Pot on your site! I haven’t tried the crock pot with the steel cut oats – those I usually soak overnight on my counter, then cook them haphazardly! They are really the best oats nutritionally, I think. Do you have a special process you use? Yes, mama is a baby boomer. And we were raised in a two-person working household when we got older, but when we were little mama was home. Cooking simple things. I feel her mother never gave her the love for it, because she didn’t like it either. I’m determined to break that cycle. Hooray for the hippies, publice television, the internet and foodtv then. It’s bringing us back! But all crock pots are a little different, so I’d check it at the hour mark. You might like yours chewier than mine. I’ll add a link on here so you can see what it looks like, but it might go to spam. I like quinoa because it’s a complete protein and it takes on any flavor you add. You use it just like you would rice. I even cook quinoa in my rice cooker. A lot of quinoa recipes on the Web are savory. You can make a “rice pilaf” subbing quinoa or you can make a cold salad using vinaigrette. But people are wising up to making it sweet so I am finding recipes for the aforementioned parfait and also hot cereal concoctions. On the downside, quinoa’s pricey. Lolly, I like the idea of the parfaits – I really like the Greek yogurt – it reminds me of yogurt I had back in the 70’s before it got all sugared up, and there’s always coupons for it, too. How do you use the quinoa? Do you cook it first?